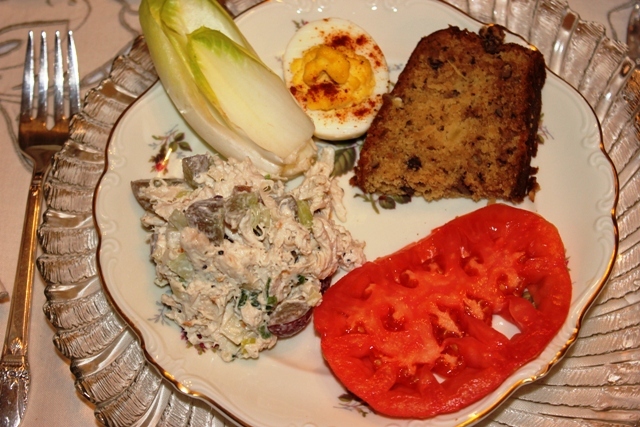 I would love to share with you the luncheon recipes. 1. In large saucepan, place chicken breasts in water to cover. Bring to boil, reduce temperature, and cook over low heat until tender. Remove from heat, drain and cool. 2. Cut chicken into 1/2-inch pieces. Add mayonnaise, onion, and seasoning blend; mix gently. 3. Fold in grapes; refrigerate several hours to blend flavors. Pop out (remove) the egg yolks to a small bowl and mash with a fork. Add mayonnaise, mustard powder, salt and pepper and mix thoroughly. Fill the empty egg white shells with the mixture and sprinkle lightly with paprika. Cover lightly with plastic wrap and refrigerate for up to one day before serving. 1. Preheat oven to 350 degrees. Grease bottom only of 9x5x3-inch loaf pan. 2. In large bowl and using electric mixer at medium speed, beat brown sugar and shortening until light and creamy; beat in egg. Stir in flour, baking soda, salt and orange juice. Stir in pineapple with syrup and pecans. Pour batter into prepared pan. 3. Bake 50-55 minutes, or until wooden pick inserted near center comes out clean. 4. cool slightly in pan. Loosen sides of loaf from pan; remove to wire rack and allow to cool completely before slicing. Note: To store, wrap and refrigerate up to 1 week. We enjoyed dessert in the living room. I shared my 50th Wedding Anniversary trip to Europe with a DVD. The ladies have traveled and have been to most places. Watching the DVD made for great conversation about some of the places I had visited on the trip. Combine flour, brown sugar, baking soda, cinnamon, nutmeg, and salt in a medium mixing bowl. Combine remaining ingredients in a separate mixing bowl. Add wet ingredients to dry, mixing just until the dry ingredients are moist. Do not overmix. Generously grease a 12-muffin tin and dust with flour or line with paper muffin cups. Fill muffin cups about 2/3-full with batter. Bake pumpkin muffins in preheated 350 degree oven for 25 to 30 minutes, or until nicely browned. 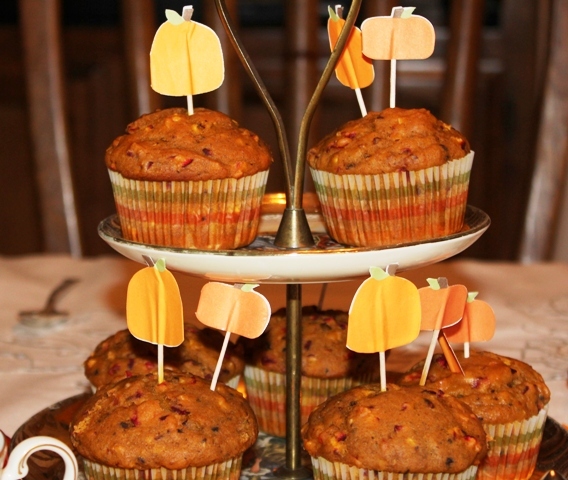 Remove pumpkin muffins from tins to wire rack to cool. Makes 12 cranberry pumpkin muffins. What a lovely afternoon visiting with good friends, relaxing with a hot cup of tea, and sitting by the fireplace reminiscing about the wonderful places we have visited. Please link back to their blogs and enjoy the wonderful inspiration they have to give. Everything looks lovley and tasty! It is so satisfying to both present and share a meal like this. I am glad you had a great day. yummy!.. 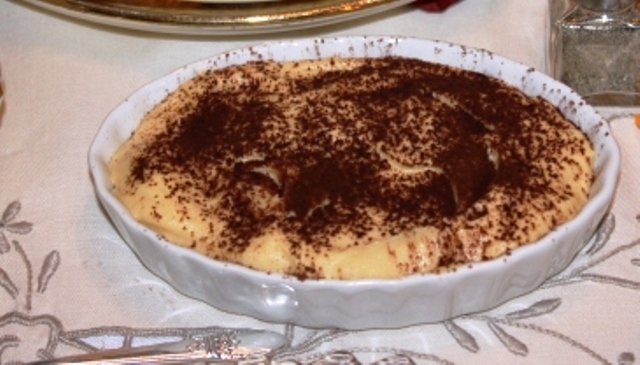 love the tiramisu and the cup super lovely!.. What a lovely harvest tea! Everything looks wonderful! 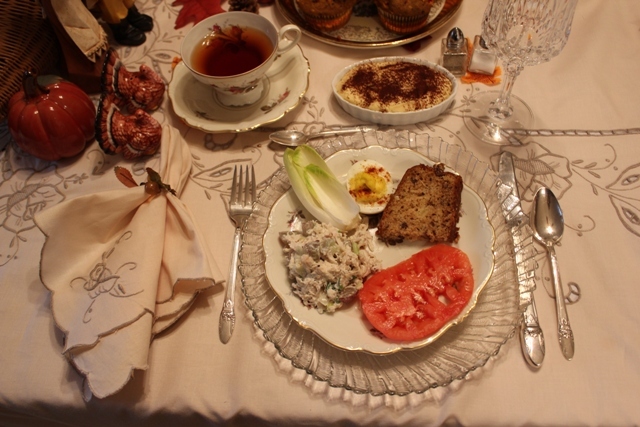 Thank you for sharing your wonderful photos and recipes. Wishing you a Happy Thanksgiving with your loved ones. 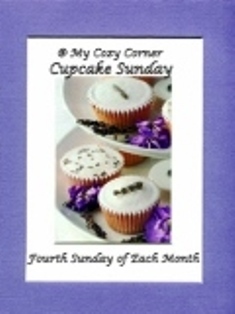 thank you for sharing this wonderful recipes. And the table is set very inviting and festive. I really enjoed it. 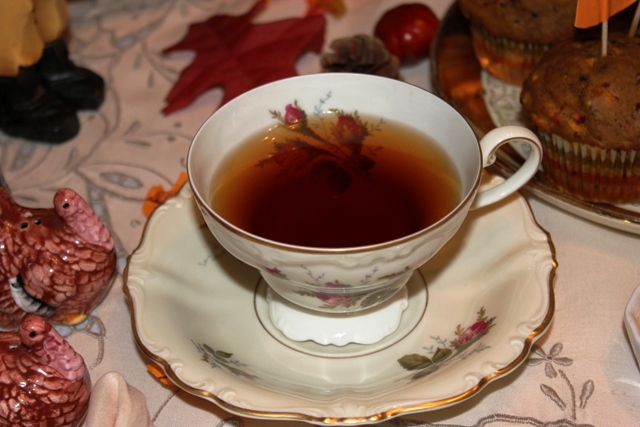 The tea cup looks like one of Rosenthal's Moss Rose. Just Lovely betty! Now I am going to have to go make something to eat! Great recipes too! Oh Yum! thanks for sharing your recipes for these. And your tea cup is a lovely vintage one. It sounds like you had a lovely tea with good friends. How fun to share the DVD and memories. I love the pretty tea cup and saucer. And thank you so much for sharing the recipes...they all sound terrific!